North American Porcupines are large rodents, belonging to the New World porcupine family. These animals are also known as the Common Porcupines or the Canadian Porcupines. They are mainly found in mixed forested areas of North America and Canada. These rodents usually live in trees. The North American Porcupines are considered to be one of the largest rodents found in North America. Body: They have a stocky appearance with the entire dorsal side being covered in sharp and hollow quills or spines. Weight: Their weight may vary between 3.5 kg and 18 kg (7.7 to 40 lb). However, they do not weigh more than 9kg (20 lb) in general. Size: The head-and-body length (excluding the tail) may range from 25.4 inches to 41 inches. Color: These Porcupines can be black or dark brown. Usually their body has a white highlighting. Head: They have a small head with small eyes and ears. The back of their head is covered in hard spines. The small face is of a darker color. Legs: The legs of these animals are quite short. The hind foot is somewhere between 3 to 3.6 inches (7.5 to 9.1 cm) in length. Like all other rodents, the North American Porcupines have four fingers on their front feet and five on the hind feet. Tail: The length of the tail ranges between 5.7 inches and 12 inches (14.5 and 30 cm). The tail is thick and barbed like the rest of the body. During an oceanic dispersal or “rafting event” 30 million years ago, the ancestors of these Caviomorph Rodents were dislocated from Africa to Brazil. They shifted to North America during the Great American Interchange three million years ago. 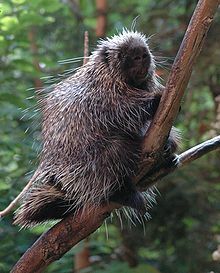 The North American Porcupines are mainly found in major parts of western and northern United States and also in mixed and coniferous forests of Alaska and Canada. Smaller populations are found in some regions of Virginia and northern Mexico. These rodents prefer bushy shrub lands and woodlands. They can also be found in desert and tundra regions. They generally live in holes of tree trunks. The feeding habits of these herbivorous animals vary from summer to winter. They feed on berries, twigs, roots, stems and other vegetations during summer. In winter, they eat tree barks and conifer needles. These solitary animals have a strong defense system and an interesting behavioral pattern. They are mainly active during night (nocturnal) and rest on trees during daytime in summers. These porcupines den in groups during winter and tend to stay close to their den. They like to sleep a lot; however, they do not hibernate. They have small legs and move very slowly. 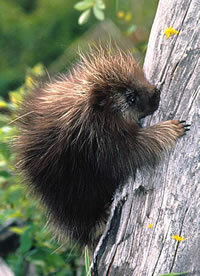 North American Porcupines cause severe damage to large trees and leather and wooden objects. Due to this reason they are considered as ‘pests’ by some people. The North American Porcupines are not as common an object of predation as other rodents. The common predators of this species include mountain lions, fishers, wolverines and coyotes. This species have some useful adaptive features and self-defense mechanisms that enable them to survive in their environment. The quills covering their body are one of the most important adaptations. These barbed quills easily detach from the body of the porcupine and painfully penetrate the skin of their attacker. This can cause serious injuries and even death (only in severe cases) of the attacker. Due to this reason, many larger animals keep away from these creatures. They have carved claws on each foot to help them climb and forage. The backward pointing hard quills located under the tail helps them to stay on tree branches. These rodents are very good swimmers with their hollow quills helping them to stay afloat. The season of reproduction starts in late summer and continues through early periods of fall. These creatures call to attract mates during reproductive seasons. Sometimes, the males fight over a female. The females give birth to a single young porcupine after seven months of mating. The young ones are born with soft quills which take a few hours to harden. They start hunting for food after two days. The young North American Porcupine stays with its mother for approximately six months. The average lifespan of this species is 5 to 8 years. However, they have been recorded to have lived for more than 10 years in captivity. The North American Porcupines are highly interesting creatures. Here are some interesting facts about these creatures. They are the second largest rodents found in North America ranking only after beavers. They have a very good sense of direction. The bone structure of the scull of these animals distinguishes them from many other rodents. 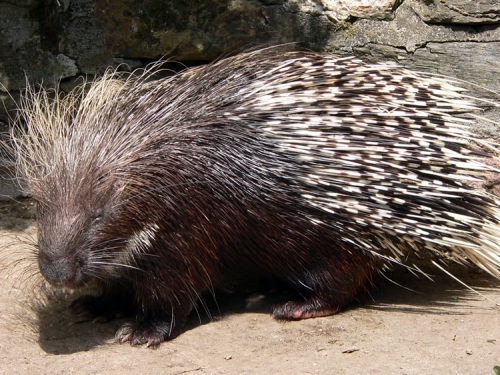 Each North American Porcupine has over 30,000 quills on their body. The sharp quills of these animals are actually hair that have modified as a part of their defense mechanism. These rodents have antibiotics in their skin that help them to prevent infection in case they are struck with their own spines. These are the only native mammals of North America to be equipped with these skin antibiotics. These animals often fall down from trees as they are tempted easily by twigs and buds growing at the ends of branches. Native Americans use the quills of these porcupines to decorate their clothing and other things like baskets. It is a common misconception that this species throw their quills at enemies, but actually the quills detach themselves from their body in case some other animal attacks them. This species is considered to be fairly risk-free and a pet law has been passed recently to allow people to keep them as pets. Here is some information about their housing and diet in captivity. 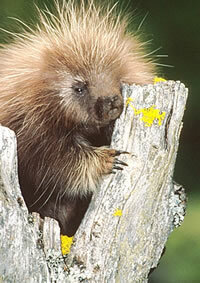 Housing: Like all New World porcupines, these animals are arboreal, spending most of their time on trees. So, the cage should encompass more vertical than horizontal space with proper protection from direct sunlight. A 5’×5’×8’ (200 cu ft) cage is ideal for a single animal. The enclosure should be increased by 20% to keep an additional Porcupine in it. Temperature: They can survive in temperatures ranging from 90°F to below freezing when provided with proper shelter. Lighting: These porcupines are naturally nocturnal. So, one may keep them in a reverse light cycle with 12-14 hours of day and 10-12 hours of night. Diet: They should be kept on a well balanced diet that resembles their natural feeding habits. One can feed them with fruits, berries, leaves, twigs etc. Handling: The sharp quills of these creatures can cause painful injuries if they pierce the skin. So, one should keep a safe distance from these quills. It is advisable to consult a doctor immediately in case these quills are stuck in skin. This species is categorized as “Least Concern” by the IUCN. It means there are no immediate threats to the existence of these Porcupines. Here are some images of these creatures. The North American Porcupines are one of the most interesting species of rodents in the world. With the barbed spines as their most unique feature, they have interested humans from the very beginning.